Commercial motorcycle operators (okada riders) in Lagos State have been given till Tuesday to begin to wear approved reflective jackets while on the road or risk arrest. 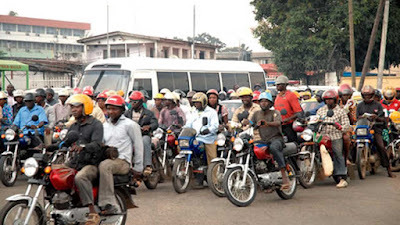 The state Commissioner of Police, Mr. Edgal Imohimi, stated this while addressing the riders on Friday, warning that the police could not guarantee the safety of any member of the public patronising commercial operators without the approved uniform. He said the action was taken to enable the police to distinguish genuine commercial motorcycle operators from criminal elements using the business as a cover to commit crimes. He said yellow and pink reflective jackets had been approved for members of Motorcycle Operators Association of Lagos State affiliated to the National Union of Road Transport Workers and the National Motorcycle Owners and Riders’ Association of Lagos State, respectively. Imohimi advised all operators to get registered for proper identification, warning that any unregistered operator found on the road from Tuesday would be arrested for illegal operation.